From the southern areas of WA to Fremantle, Perth and north to Broome, garden pots are in demand. 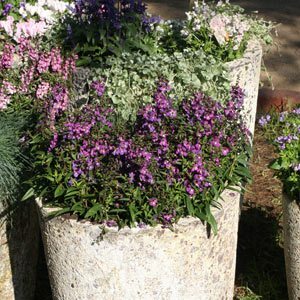 For aesthetic and practical use, landscapers now have access to more garden pot suppliers and more styles than ever before. We look at some of the leading suppliers of planter boxes, garden pots, lightweight and metal pots for sale for the home garden and landscaping industry in Perth and Western Australia..
Nurseries and wholesalers supplying a wide range of classic design pots and planters as well as modern and contemporary designed GRC, timber and terra cotta styles. Wholesaler of garden pots and accessories from around the world. All pots available from our warehouse in Melbourne, for distribution Australia wide & overseas. Glazed Outdoor & Indoor, Atlantis, Thai Limestone, Old Stone, Lightweight Metro Light, Pret-a-Pot, Iron Rust, Rustic, Cast Iron. GRC Pots, Light Weight Pots, Atlantis Feature Pots, Glazed Pots, Old Stone Pots, Fibreglass Pots, Water Features, Urns & Pedestals. Australian franchise of the international brand IOTA Garden and Home. We work closely with landscapers, architects, and developers, orders of all sizes from domestic projects to contract supply for developments and public works. Unique range of lightweight fibreglass, glazed, rustic old stone sandstone/clay and pottery for backyards and patios or commercial design features.